Turmeric milk contains that popular yellow-colored spice found in exotic Asian cuisine and provides curry powder its yellow dye. Turmeric also has an active component called Curcumin, the bright yellow soluble that comes from certain plants. Curcumin has been used in Ayurvedic medicine, one of the oldest holistic healing techniques. Many people have used this for centuries because of its powerful antioxidant properties. Antioxidants refer to compounds that help prevent cell damage and protects our bodies from oxidative stress. Both the Ayurveda and Unani medicine systems of India have been using Turmeric for many centuries with extremely positive results. 1. Turmeric Milk has potent anti-inflammatory and anti-oxidant properties that provide glow and gleam to the skin. It is an effective exfoliator that facilitates removal of dead skin layers which brings out the smoothness as well as softness of your epidermis. 2. It is ideal as a skin-brightening solution. One of the primary reasons for darkened skin is the presence of melanin (natural pigment that determines the complexion) on the top layer. With more melanin, the skin tone gets darker. Turmeric has the capacity to regulate melanin production and therefore reduces skin tone for a brighter complexion. Likewise, it protects the skin from harmful sun’s rays that causes photo-aging. 3. Turmeric milk has emerged as a trendy beverage in many countries particularly during the winter months. Drinking this milk will help you feel warmer and more comfortable when the temperature plunges. 4. Turmeric milk compliments treatment of acne and dry skin due to its anti-inflammatory attributes. Sonage’s Tulsi Soothing Tri Clay Mask uses turmeric as one of its many beneficial ingredients to calm redness and irritation in the skin. 5. It aids in curing stretch marks and scars. The Curcumin deeply penetrates cell membranes and modifies their physical properties. You can use Turmeric milk with curd or clotted (thick) cream made by steaming cow’s milk. 6. Turmeric milk also boasts anti fungal properties that significantly contributes to the reduction of dandruff. The Curcumin moderates the so-called TGF growth beta one, secretory protein that may exacerbate hair loss. 7. Just like ordinary milk, Turmeric milk contains various minerals such as potassium, copper, iron, and zinc required for the body’s healthy growth. Likewise, it contains dietary fibers and vitamins good for your health. 8. The antibiotic elements of Turmeric milk along with its rich source of calcium are natural ingredients that can prevent infections and several diseases. It is an effective cure against environmental pollutants and unsafe microorganisms. 9. Turmeric milk has tremendous antioxidant properties that enable it to search for free radicals, restrain peroxidation which is the oxidative degradation or deterioration of lipids (fatty acids) that include natural oils, and minimize iron complex. Sonage’s High Impact Vitamin C Serum uses a blend of antioxidants including turmeric, to protect your skin from UV damage caused by the environment. 10. The milk is anti-microbial thereby capable of dealing with bacterial and viral infections. It can treat ailments associated with the respiratory system because the spice heats up your body. Hence, it aids as fast relief for sinusitis, bronchitis, asthma, and lung congestion. 11. This turmeric in this milk comes from raw turmeric or Kachi Haldi that clinical studies have suggested may help in the prevention and growth of cancerous cells and impairing the DNA and diminishing side effects of chemotherapy. 12. Being anti-inflammatory, turmeric milk protects against stomach ulcers. In traditional Ayurvedic medicine, turmeric is a natural aspirin that cures pains, headaches, and swelling. 13. Turmeric milk can be helpful in reducing inflammation and muscle pain. 14. It has been effectively used to treat colds, congestion, and sore throat for both kids and adults. 15. And finally, Turmeric milk is the perfect beverage to sip on before bedtime to promote weight loss. It supports metabolism because of its thermogenic properties that quickly burn unwanted calories. At the same time, it serves as an excellent source of protein, prevents accumulation of fats, and helps digestion. 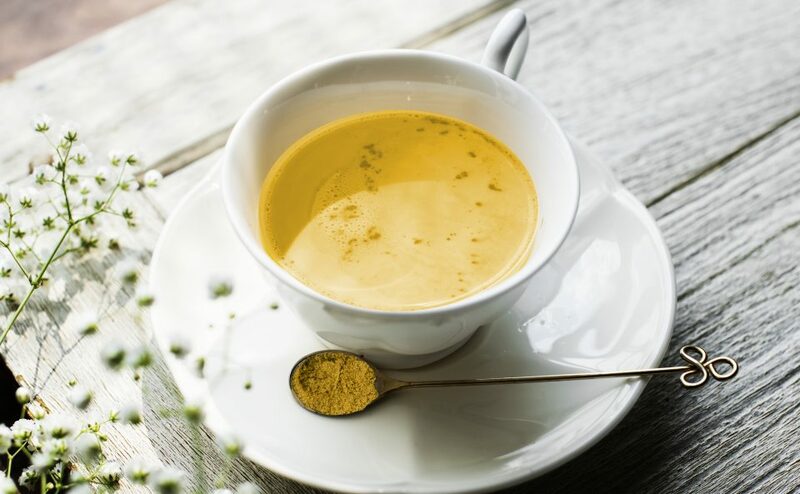 The trending “Golden Milk” is a holistic beauty and health drink for total wellness, grab a drink and start reaping its benefits.